For 13 straight years Keystone Cougar has been the #1 selling RV in its class and it’s obvious why. It offers more features, floorplans, and amenities than competitors. Whether you’ve got a large family and are looking for a bunkhouse option that will sleep everyone or are a couple simply seeking a space to relax together Cougar fifth wheels have something for you. 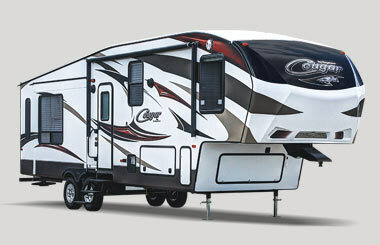 Read our Keystone Cougar fifth wheel review to learn more about what these RVs have to offer. This 34′ fifth wheel sleeps 4 people. As soon as you enter the RV you climb a couple of stairs to reach the front bedroom. It holds a queen sized bed that is located in a slide, a full height wardrobe, washer/dryer prep, and a dresser located across from the bed. The rear living area includes a hide-a-bed sofa and adjacent range and refrigerator located in a slide, two chairs against the back wall, and an additional slide with a free standing dinette and entertainment center. At the center of the kitchen is a tasteful island that includes a double sink. Ideal for small families and couples, this RV is a wonderful choice for anyone seeking comfort. With space for 5 people, the 37′ long 337FLS is the perfect option for small or medium sized families. It boasts a rear bedroom that includes a queen sized bed in a slide, along with two wardrobes and a dresser across from the bed. The bathroom is located in the hallway outside of the master bedroom and includes neo-angle shower and a linen closet. 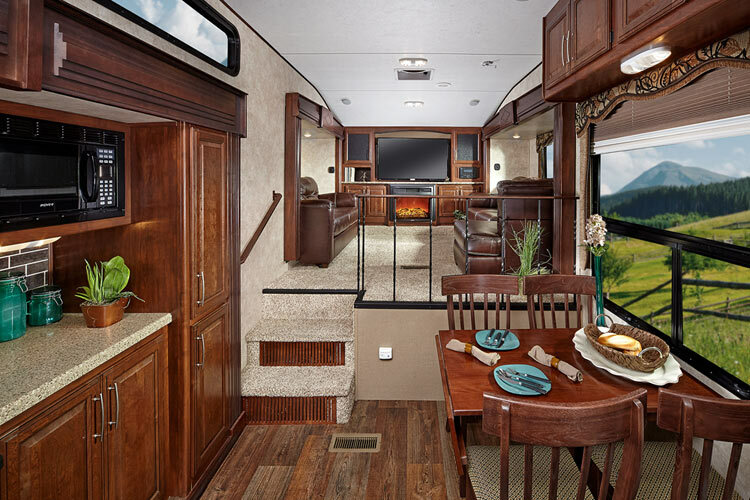 In the middle of the RV is the kitchen, which features a lovely L-shaped countertop and a slide that includes a refrigerator, 3 burner range, and pantry. At the front of the RV is a huge living area. The entertainment center is located along the front wall, while a hide-a-bed sofa and an L-shaped sofa are located in separate slides across from each other. If you’re interested in learning more about Keystone Cougar view our Cougar inventory online or contact us with questions. We’re happy to help you find the best floorplan for your needs. We offer low prices and no hidden freight or prep costs. What you see is what you pay.